The General Services Administration soon will begin replacing its 16-year-old human resources system. The Comprehensive Human Resources Integrated System will reduce paperwork and free the HR staff to advise managers about recruiting, compensation and other personnel matters, officials said. GSA has customized an Oracle package so that HR users will be able to access OPM personnel data. GSA implemented its original system in 1983. But by the late 1980s, Lovelace said, GSA brass realized they needed a system that could handle more functions. In 1996, the agency began to research HR systems in earnest. The HR team, with help from the chief information and chief financial offices, conducted a six-month feasibility study. 'We combined our efforts to make sure we were making the best business decision,' Lovelace said. By that October, GSA had bought the Oracle Federal Human Resources System to build CHRIS. For eight months after the purchase, a project team worked with Oracle Corp. systems staff to study the product, said Judith Westbrook, the agency's project management director. 'We formed a development team to learn piece by piece the system'what was there and what was lacking,' she said. Lovelace said the team also analyzed ways to re-engineer archaic business processes. 'One of the worst things anyone can do is to take old processes and automate them,' she said. Oracle built a layer on top of its core product to accommodate additional functions GSA needed, such as multiple interfaces to systems within and outside the agency. Westbrook noted, however, that GSA customized as little as possible to assure its maintenance agreement with Oracle and to benefit from software updates. To help with the tweaking, GSA hired TranTech Inc. of Alexandria, Va. The process took time. GSA this May finally began its first parallel testing, which took four weeks. One thing that helped was that GSA got users involved during the testing, Westbrook said. Before the testing began, the program team in March had trained two users from each of GSA's 11 regional HR offices at the Kansas City, Mo., regional office. The program team and users then worked together to iron out the kinks. Last month, GSA ran a second parallel testing, using the system generate live HR reports. It also tested systems administration and security applications. 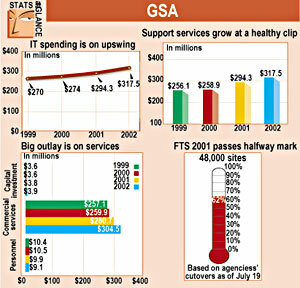 GSA plans a phased implementation. For the first payroll period after the system is brought online, only 70 users in GSA's 11 regions will access CHRIS. The team will bring the remaining 200 HR users onto the system in waves. To run CHRIS, users need at least a 166-MHz Pentium with 32M of RAM, 2M of free space on the hard drive and Microsoft Windows 95. The host system is a four-processor IBM RS/6000 with 100G of storage and running AIX 4.3.2.